Running from the Law: Happy Halloween! Hope you all had a lovely, safe and candy-filled Halloweekend! We had a blast! 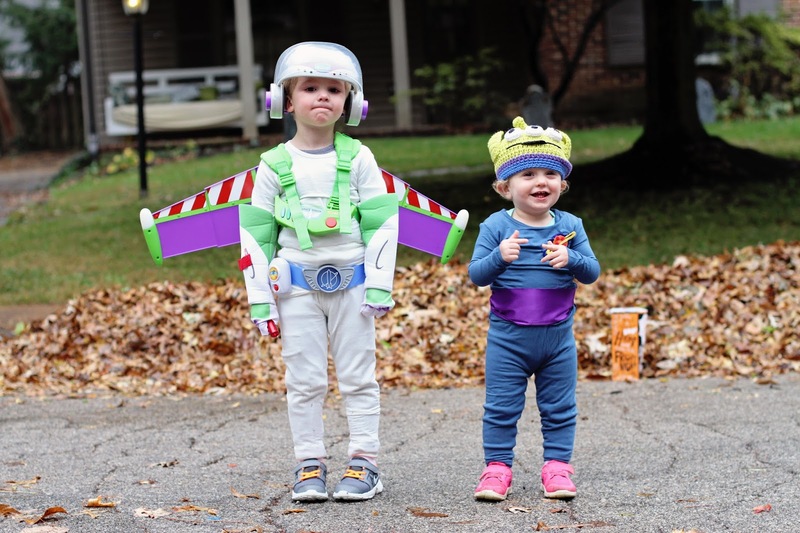 Little Buzz Lightyear declared it the greatest day of his life, other than Florida. I think that's a pretty big deal for a three-year old. The kids rocked their costumes and loved playing dress up for the day. Both kids were wearing Kickee Pants jammies as the base (of course), so they were super comfortable and looked awesome! Mac is obsessed with his jet pack wings and has only taken them off to sleep in the last three days. Ryan and I decided last minute to join in on the fun and got matching Woody and Jessie costumes, after Mac asked us a million times what we were going to be for Halloween. We certainly didn't want to disappoint and the look on his face when we walked in the room in our costumes was absolutely priceless and worth every last minute marked-up penny we spent on them! The night went great! Mac was so good at telling his joke (What's a ghost's favorite fruit? Booberries!) and saying thank you at every house. He loved ringing the doorbells and when dogs/cats came to the door to greet him. He'd give them kisses through the glass. It rained the entire night, but that didn't stop us or even slow us down! There weren't very many kids out, so houses were giving away giant handfuls and scoops of candy. Two houses just dumped their entire candy bowls into Mac's bag and turned out their lights! Mac did three streets and lasted until 7:30 when his bag was so full he could barely carry it! Mim made it to about 4 houses and then became fixated on eating a sucker and couldn't be bothered to continue. Both kids were passed out in a sugar coma by 8:30 p.m. leaving the grown-ups all the candy! I love this! I absolutely love this. I may have to steal this idea for next year. The only difference is that there is no way my daughter would let me be Jessie. So cute and I loved that both you and your husband dressed up. I LOVE your family costumes!! Mac is a perfect Buzz I can just hear him running around! Mim looks adorable too but I'm pretty sure she'd be happy doing whatever :) Looks like you guys escaped the rain for a little bit to get out? Great family photo by the way!! It's a perfect Halloween shot! Great family costumes!!! It looks like a blast! I love the fact that Mac actually told his joke! Way to go buddy!! I think watching the kids is the best part! And leaving the candy for the adults...even better!! You ROCKED the family themed costumes! So freaking cute/awesome. And score in the heaps of candy!! I love y'alls costumes!! 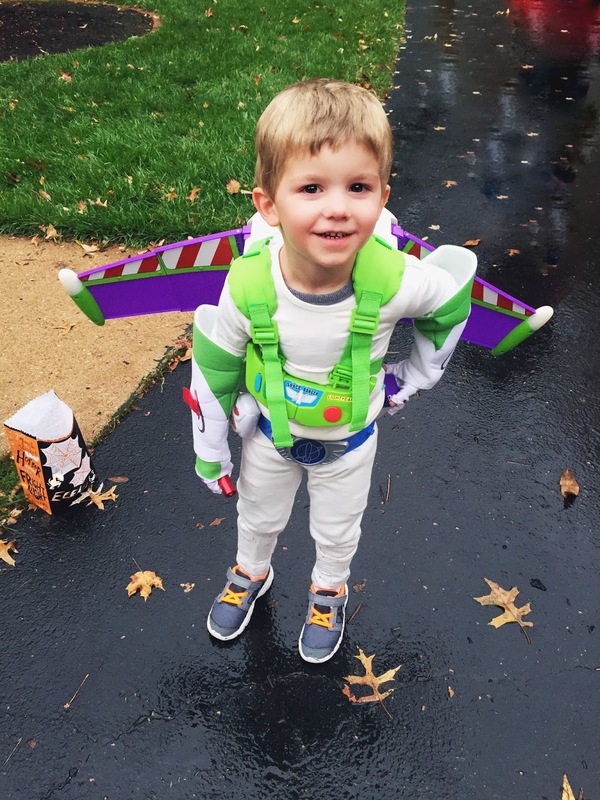 And I'm super impressed that you guys went on with the trick-or-treating, rain or shine! Thanks for linking up! 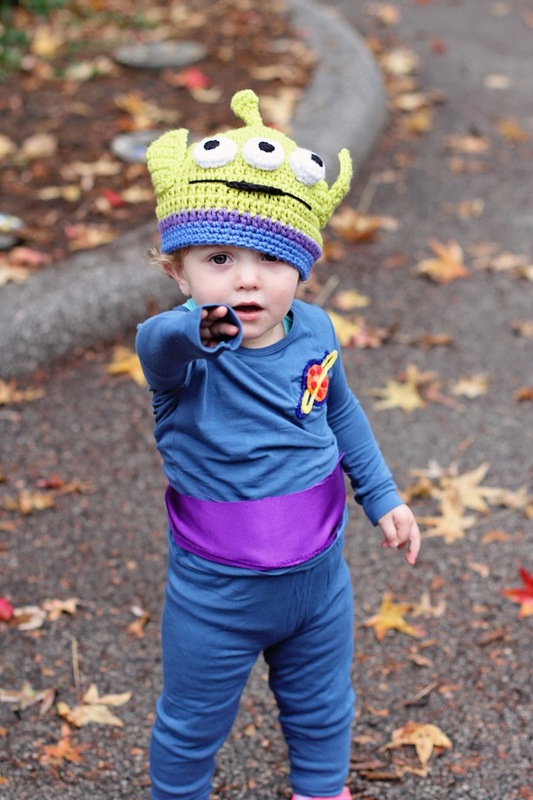 I love your family toy story costume! Not sure if I could get Chris on board for something like this! I also love that you used pjs as the base and just added the accessories... Super smart! I LOVE that you guys did this and so glad he did so well with his joke!!! I love that you dressed up for Mac! Coolest parents ever!!! I love the theme costumes! We want to do that next year. Y'all look great :) We're thinking of doing Thing 1 and 2 with the Cat in the Hat. Awesome family costumes!! I absolutely love the picture of Mac kissing the dog through the glass! Loooove that you dressed up for him!!!! So much fun! I'm so excited that y'all went family style! Too fun. And those wings really are awesome. I would have done that with our candy bucket if any kids had stopped by after 9 or so. We run out of candy every year, but no this year hardly anybody and I had way too much left over. You guys are the cutest!!!! I love that you all dressed up!!!!! Aww! How fun! Y'all look adorable! Sounds like the best Halloween ever!! You all look great! Your costumes were GREAT!! Glad you had a great Halloween! Adorable costumes! Mim cracks me up! Oh my word. You guys are the cutest. 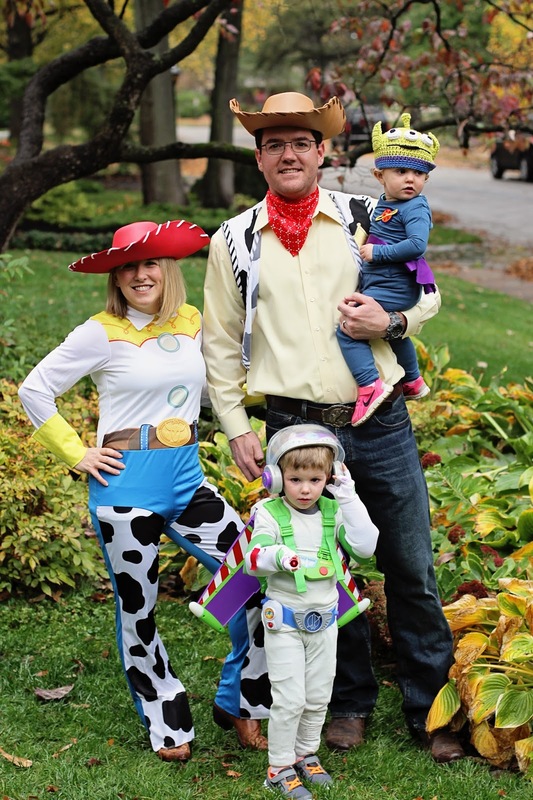 I love that you were able to find the Woody and Jessie costumes to complete the family costume!! So awesome. And score on the candy!! Im SO glad you were able to get adult costumes too! This is the cutest family costume, I just have to smile whenever I look at your picture. Oh my gosh, they look so cute and it sounds like they had a blast! At least I know Mac did. So happy you guys were able to find matching costumes last minute. 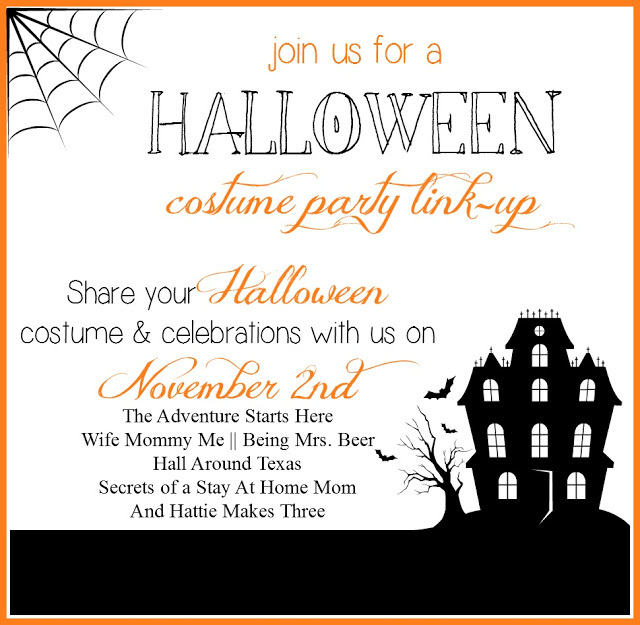 You look so cute in your family costumes! Amazing pictures and such a great idea!! You guys are too cute! This has got to be the cutest family costume. Toy Story is a favorite in our home. We spent Friday night watching them all because Connor wasn't feeling well.